We offer unique one-on-one coaching for HR and Employee Benefits Professionals and for Businesses – our exciting new resource for individuals who want to broaden their benefits management and leadership skills. Try risk free﻿. Our employee benefits strategic leadership and management system and products, services and publications that help transform benefits programs and benefits professionals' careers using an integrated system of tools and techniques for managing employee benefits. Employee Benefit News Forum & Expo - September, 2013 - "Career Growth for Benefits Professionals"
﻿SHRM Annual Conference & Expo - June, 2013 - "How Voluntary Benefits are Revolutionizing the Compensation/Total Rewards Equation"
"Creating the Next Generation of Benefits Leaders: Ehancing Your Impact by Developing Your Team"
﻿A strategic and tactical intensive workshop for those responsible for benefits success at their organization. ﻿We’re proud to have organized and sponsored our Voluntary Benefits Employer Boot Camp™ events, where employers learned how to use today’s Voluntary Benefits for competitive advantage. To receive updates and announcements on our Managing Benefits™ Events﻿, sign up for our newsletters. Click here. 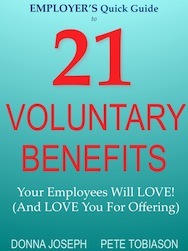 We coach benefits brokers/consultants, vendors and service providers by delivering our experienced employer perspective. 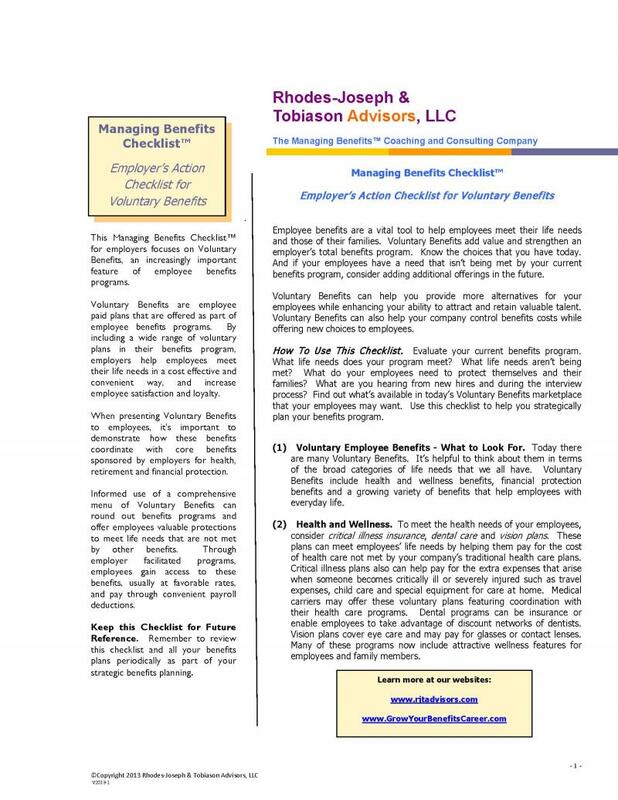 Employers - use this valuable tool to help you navigate Voluntary Benefits, an increasingly important feature of employee benefits programs.